Kids are naturally curious about their bodies—how they work, what's going on when they get sick, why and how they're changing—especially when they hit the tween and teen years. If you've ever tried to find information using a search engine like Google, though, you'll know the results can be pretty eye-opening—and not in a good way. So steer them to one of these kid-friendly sites for health-professional-vetted information and advice. 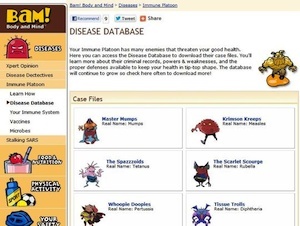 The KidsHealth site provides a wealth of information that's parsed for kids and teens separately. Kids can find out what causes hiccups, what it means to be big boned or why people need to sleep, among many other things. Plus, there's a section devoted to explaining adult health problems like Alzheimers, heart disease and ulcers. The teen section addresses more mature issues, like relationships, drugs and sexual health, in addition to a wide range of health issues. The information is curated by health care professionals and underwritten by the Nemours Foundation. Geared to teens and college-age students, Go Ask Alice! 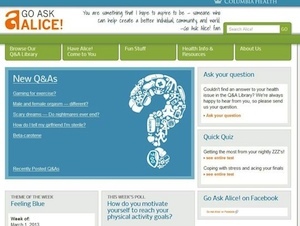 answers users' health-related questions. Currently there are more than 1,000 questions on file that fall into one of seven categories: Alcohol & Other Drugs, Emotional Health, General Health, Nutrition & Physical Activity, Relationships and Sexual & Reproductive Health. If you can't find the answer to your question, you can submit your own. Each week a panel of health professionals answers new questions. Answers in the database are periodically reviewed and updated. In addition to Q&A, the site has quizzes, polls and health news. The site is produced and underwritten by Columbia University. Need to find out how to deal with a bully? Do you know what SARS (Severe Acute Respiratory Syndrome) is and where it comes from? Ever pondered what bacteria and fungi might be lurking in the locker room? BAM! is a fun site that is a perfect place for tweens to explore health, fitness and social questions. The age-appropriate guides, articles and quizzes are written by health professionals at the Centers for Disease Control and Prevention. One caveat, there's an A-Z index at the top of the page, which provides access to content geared to adults. 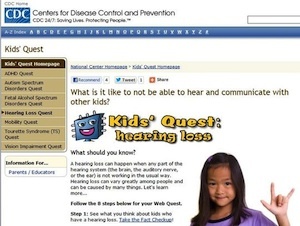 The CDC's Kids' Quest site provides basic facts on mental disorders, like ADHD, Autism and Tourette Syndrome, and physical impairments, like vision and hearing loss, to make them understandable to tweens. Plus, there are quizzes to help kids sort fact from fiction and suggested books and bios of famous people with each disorder or impairment. As with BAM! Body and Mind, the content is curated by the Centers for Disease Control and Prevention and there's an A-Z index at the top of the page, which provides access to adult content. We hope one of these sites helps you answer health questions by and about your kids. If you know of any great online resources we've missed, let us know in the comments.